From left to right: Private First Class Samuel Stenzler (September 15, 1893-May 26, 1942); Private First Class Frank Spear (1919-July 9, 1945) and Captain James McDonald Gallagher (1915-April 9, 1942) are resting with hands bound during the Bataan Death March to Camp O'Donnell, Capas, Tarlac, Philippines in a captured Japanese photo. Their hands are bound because they were found to possess either Japanese money, personal photos, or some other contraband. The figure to the extreme right is a Japanese soldier, who the three appear to be listening to. It's likely Gallagher and possibly the other men were beaten soon after this view was taken. None of the three men would survive captivity; all were weakened by lack of food, extreme stress, and constant movement. Samuel Stenzler was born in Tluste, Poland (then part of Austria) and immigrated to the United States as a child. He married and resided in San Antonio, Texas, applying for American citizenship in 1909. Stenzler registered for the draft in World War I, listing his occupation as "Soldier (Discharged)." After the death of his wife, he rejoined the United States Army on February 27, 1940, and was assigned to Company C, 31st Infantry Regiment of the Philippine Division, the premier American fighting unit in the Philippines. The 31st Regiment fought in the Battles of Layac (January 6, 1942) and Abucay Hacienda (January 17-24, 1942). C Company renamed the Abucay battlefield "Dead Men's Hill" because of their losses and the high number of Japanese casualties. The 31st Infantry Regiment fought a delaying action through April 1942 but was short of food, ammunition, and reinforcements throughout the campaign; the unit never had more than 60% of its authorized strength available. 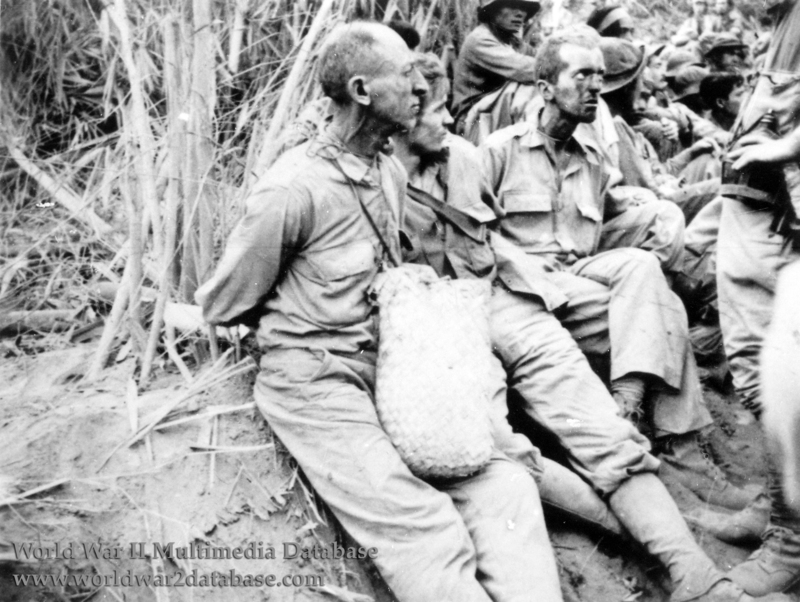 Company C surrendered on April 9, 1942 with the rest of the 31st Regiment when United States Army Major General Edward P. King capitulated the Bataan peninsula. Stenzler died at Camp O'Donnell on May 26, 1942, probably because of starvation, constant physical and mental abuse, and overwork. His remains were repatriated and reburied at Long Island National Cemetery on October 18, 1949. Frank Spear was born in Ledalis, Missouri. A Mormon, Spear enlisted on August 13, 1941 in Salt Lake City, Utah, and arrived in Manila aboard one of the last transports before the war began and was assigned to the Far East Air Force's 4th Chemical Company (Aviation). When the 31st Infantry was depleted in combat, Spear and the rest of 4th Chemical were assigned to the regiment because they had infantry training. Spears served with I Company after the Battle of Abucay Hacienda. After surviving Camp O'Donnell, Spear was sent on the "hell ship" Taga Maru on September 20, 1943 to Niigata Camp 5-B, arriving in Osaka, Japan on October 5. Camp Commandant Lt. Tetsutaro Kato personally executed Spear on July 9, 1945, after Spear became insane with hunger and attempted to escape several times. Spear was bayoneted several times in front of the whole camp. Kato was sentenced to death for killing Spear by the International Military Tribunal for the Far East, but his sentence was commuted to twenty years by SCAP Commander General of the Army Douglas MacArthur. When control of Kato was returned to the Japanese government in 1950, he was released with time served in 1952. Kato wrote ""Watashi wa Kai ni Naritai" ("I Want To Be A Shellfish") a novel dramatizing his wartime experiences and incarceration, claiming he was ordered to kill Spear by his superiors. The novel was made into a successful television movie in 1959 by Tokyo Broadcasting Service, and remade for television in 2007 and into a theatrical film in 2008. Spear's insanity, brought on by years of malnutrition, confinement and torture, is not mentioned, nor is Spear mentioned by name. Spear is memorialized at the Manila American Cemetery. James M. Gallagher was born in Philadelphia, Pennsylvania and attended Georgetown University in the mid-thirties. He attended Reserve Officers Training while in college. After college he joined the United States Army. When he arrived in the Philippines, he was assigned as a training officer to the 33rd Infantry Regiment of the 31st Infantry Division of the Philippine Army. Gallagher was killed the day this photo was taken or soon after. His family published a book of his letters home in memory of him. Gallagher was also honored in the annual of the American Catholic Historical Society of Philadelphia. Gallagher was left off the official Prisoner of War rolls because he died on the Bataan Death March; his body was never recovered. He is also memorialized at Manila American Cemetery. Gallagher was awared the Sliver Star, the Bronze Star and the Purple Heart. Special thanks to Roger Mansell http://www.mansell.com/ for his assistance in researching this photo.